I’ve just updated and re-named my free first phonics picture book for preschoolers, little kids just starting school, and older struggling readers/spellers. The old name, “44 sounds, 44 spellings”, was a bit obscure, so while I was fixing picture credits and other stuff, I called it the blindingly obvious “First Phonics Picture Book“. This book is for parents and teachers who want a simple framework for talking to children about the sounds of English, and how sounds are represented by letters/spellings. The picture book is a downloadable colour pdf which you print yourself, so teachers can also use its pages in wall charts, on interactive whiteboards or on tablet or other computers. There are 44 sounds in spoken English, but I’ve stripped my free first phonics picture book back to 42 sounds and spellings. I left out the two sounds which mostly occur in multi-syllable words – “zh” as in “vision”, “treasure” and “seizure”, and the unstressed vowel “uh” as at the end of “butter”, “actor”, “dollar”, “centre” and “flour”. These are both a bit too tricky for real beginners. I’ve used the sub-headings “short” and “long” for vowels even though “short” vowel sounds aren’t really short versions of “long” vowels. By “short” vowels I mean vowels which are always followed by a consonant. These vowels don’t occur as the final sound in English words (with the possible exception of the teenage/hipster word “meh”). 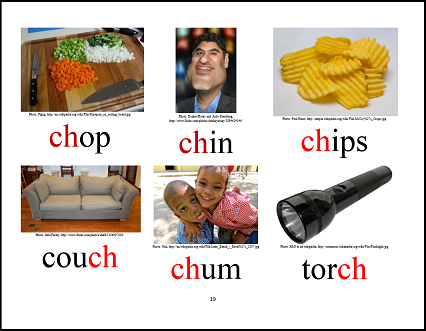 The picture book has a page for each sound, where possible giving the most common spelling of that sound. I was unsure which spellings to use for three of the vowel sounds – “oo” as in “good” or “put”, “ooh” as in “moon”, “June” or “chew” and “you” as in “cute” or “new“? If you find any of them round your house or in your early years facility or classroom, I suggest you throw them in the bin, or at least put them on a high shelf. 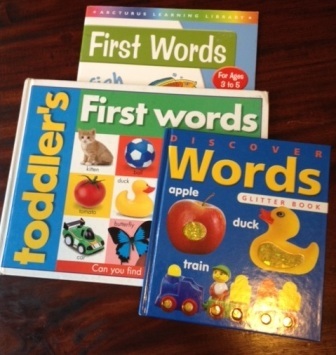 Most “First Words” type books don’t help little kids with cracking the spelling code, and can actually confuse them. Instead of presenting only a limited number of simple patterns, they suggest via their vocabulary (“supermarket”, “butterfly”, “elephant” etc.) that the relationship between sounds and letters in English is impossibly complex. From there, it’s only a short mental leap to the conclusion that the only way to tackle reading and spelling is by memorising words as wholes. This is the wrong strategy, and takes a lot of kids a very long way up the creek without a paddle, from whence people like me have to go and rescue them. I want little kids’ “First Words” type books to show them how sounds and letters actually work, but the English spelling system is too complex to teach all at once to beginners. They need to start with just a small number of sound-letter relationships, as occurs in Synthetic Phonics programs. Any First Words picture books presented to them should help them understand how sounds and letters are related, not confuse them on this issue. Initial phonics books, with 26 letters at word beginnings, of the “a is for apple, b is for banana” variety, are also worth examining closely. They often say things like: “a is for apple, apricot, arm, aeroplane, autumn, altar, and any”. Say the first SOUNDS in those words out loud: apple, apricot, arm, aeroplane, autumn, altar, any. You should say and hear something like: “a, ay, ar, air, aw, o, e”. These words all start with different sounds. This suggests to children that letters and sounds are only loosely, or perhaps randomly, related. Again it can encourage children to try to memorise words visually, not sound them out. The place for beginners’ books like this is also the bin, or if they’re not yours to throw out, a high shelf. I don’t mind the initial phonics books which stick to words with the same initial sounds, as in “a is for ant, act, ads, axe, apple, ankle, animal”. 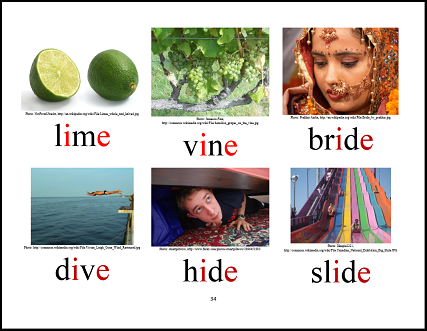 If you’re not sure about whether to toss out an initial phonics book, try the above exercise with it – say the first sound for each word, particularly on the pages for A, C, E, G, I, O, S, T, U and X. If you’re saying more than one sound for each letter, it’s not a book I’d recommend for absolute beginners. However, initial phonics books only teach 26 letters and 23 sounds, and only at word beginnings. The letters C, K and Q represent the same sound, and X in initial position represents “z” as in Xavier, xenon and xylophone. There are another 21 speech sounds and associated spellings which kids need to be aware of, 19 of which are common in one-syllable words. I hope my free First Phonics Picture Book fills a gap in the educational market, and that you find it useful. Click here to download it for $0 now. I have also updated the other, more complex version of this book, which contains multiple spellings for each sound. Click here for the advanced version, which is also $0. One day soon I’ll find the time to make an intermediate version with just two or three spellings for each sound. 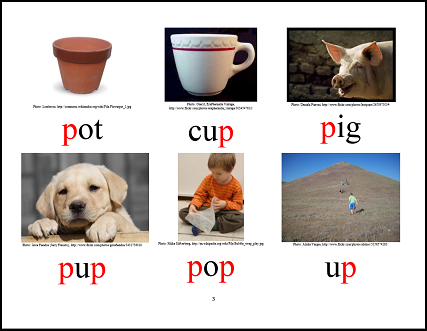 This entry was posted in phonics activities, sound-letter links, teaching strategies, vowels on January 27, 2014 by alison.